rag curls! 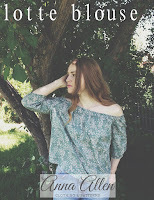 | Anna Allen Clothing Blog: rag curls! Last night I decided to attempt doing my hair up in rag curls. This is one method of curling I have not tried before. It turned out to be super easy and incredibly comfortable to sleep on. You kind of look ridiculous, but that is no big deal. I made myself look even more ridiculous by putting a hairnet on over the curls so they would stay in place better. 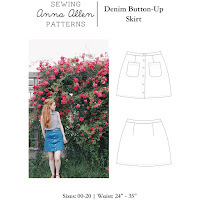 Anyway, I didn't get a picture before taking the rags out, but you can see a great tutorial on how to do it over at Vixen Vintage. I did find, however, that 7" long rags work better for longer hair. The 5" length strips were almost too short. I think I used somewhere around 16 rags. Also, I have really thick hair, so I like to use a spray bottle filled with water to spritz my hair rather than dunking my head under water. :) Otherwise my hair will not dry in the morning and I hate it when that happens! After I woke up, I left my hair in the rags a bit longer since I wanted to make absolutely sure the curls were totally dry before taking them out. You can always tie a pretty ribbon around your curls to keep them out of the way while you get breakfast! When styling my hair, I like to use just a tiny bit of argan oil rubbed between the palms of my hands. I first work it into the ends of my hair and then continue up to the top of my head, smoothing out any frizzies. It has worked really wonderfully ever since I discovered it last spring. Then I brush the curls out and away from my face, using my other hand to smooth out the hair while brushing. If you like, you can add a few bobby-pins to keep your hair out of the way. I'm excited to see what my hair will look like tomorrow! Note about my hairbrush: I use this brush by Sonia Kashuk and although I have never used the Mason Pearson brush before and can't say how good it is, Sonia's brush is amazing on my hair. Every now and then I will clean it by immersing it in a glass of warm water/baking soda solution and let it soak overnight. In the morning, just rinse it off with water and it's sparkly clean! I've had this brush for about two years now and can definitely recommend it! This looks really cute! Lately I've been using the curling trick where you wind it around the elastic headband, which was featured on your blog and a couple of others. I really like it! My hair is really thick and sort of crazy wavey and I've found that argan oil is awesome on it, shiny but not greasy. I've also found that the tressemme heat taming spray makes a great smoother and tamer, even when you're not using heat. I use that and the oil to calm my hair down and also as a detangler on my 4 year old's very long hair. She howls less when I use it anyway, lol. Hope you're settling in nicely in your new place! Beautiful curls! I'll have to google the argan oil :) I tried rag curls a couple of days ago for the first time but mine didn't come out as nice as yours. I have very thin hair though, that might be why. So cute. The first thing I thought was sleepover party. I have really thick hair too so I like the spritzing trick because my hair would never dry by morning. I will have to see what the argan oil is. I haven't heard of it. Those look so, so perfect on you! That robe is so amazing! I want one. Did you make it? It's beautiful with your curls. Very glamorous. I did rag curls a long time ago after reading about it in the AG Molly book, ha ha! 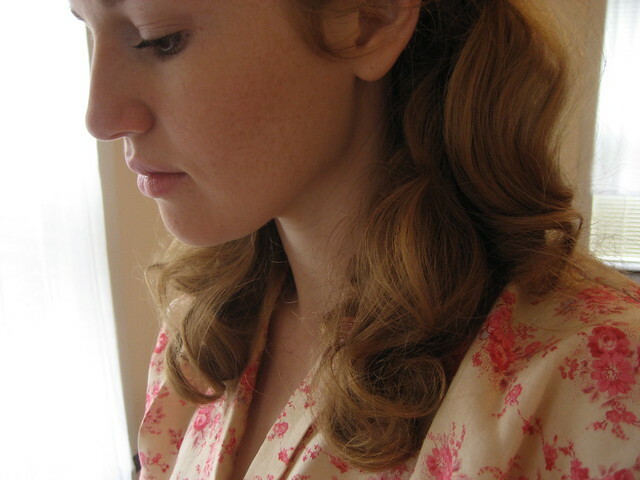 I haven't done it for a long time, but now I do pin curls sometimes for a date. Thanks everyone! I highly recommend you try out rag curls if you haven't yet. Also, those of you looking into argan oil, I got mine on Amazon, but I think Sally Beauty Supply has it also. It's the cheaper version of Moroccan oil. Jenny, yes I made the robe. :) I used a tutorial online somewhere on how to make a kimono. 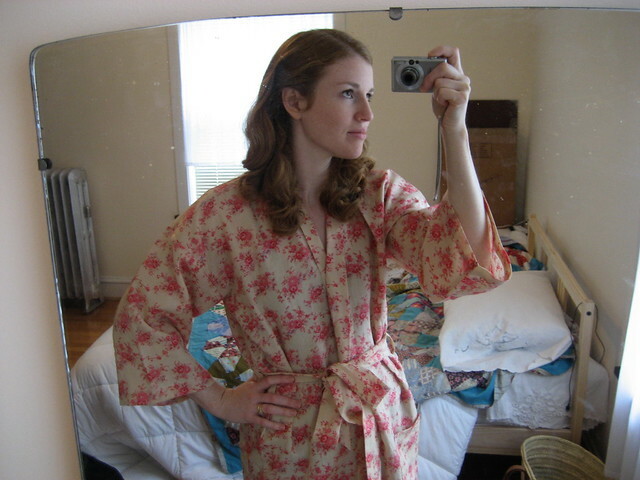 I was inspired by the lounging robes from the '20s and '30s. Now I want to make one out of a pretty silk. I didn't make a pattern either, just cut a bunch of rectangles. I wish I could find that tutorial online again. If I do I'll post it. I didn't have a lot of fabric to make it either (1.5 yards I think). I had to laugh at the reference to American Girl dolls! Awesome. 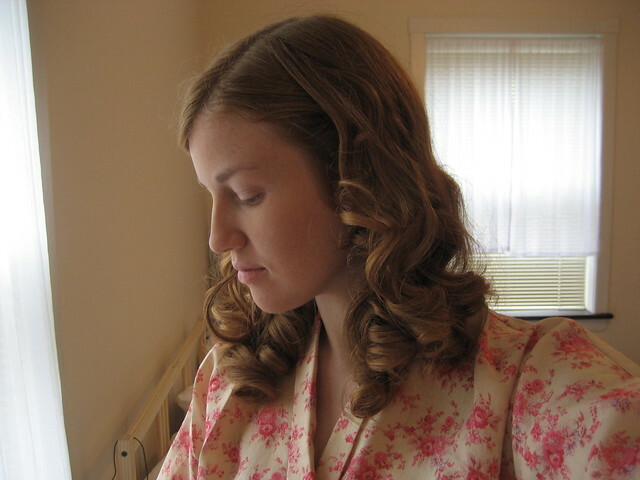 I am pretty sure I tried to pin curl my hair after reading that Molly book. My mom said her mom used to pin curl her hair and on cold nights her face would puff up like a chipmunk!